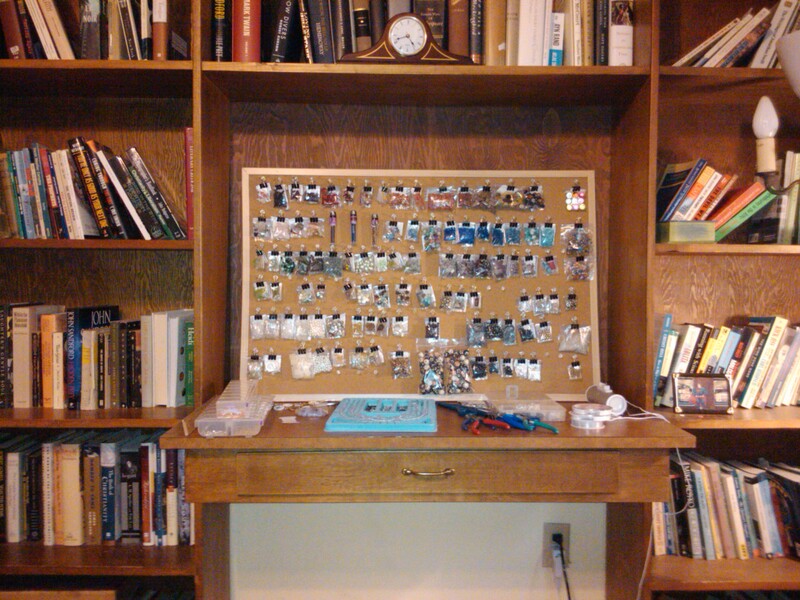 One of the biggest challenges I’ve faced since I began making jewelry was finding the time and space to work. In a house occupied by nine people, two of them my children, an empty surface and a free hour rarely coincide. And I’ll admit, it’s been hard for me to prioritize my own personal endeavor over tending to my kids’ whims or doing things together as a family. Something about the arrival of spring, however, gave me the motivation to clear out a space in my room and make myself a tiny little studio. 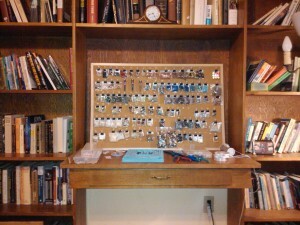 It’s just a desk surface, a drawer, and a freakishly organized cork board, but it suits all my needs. And once I had a studio, I was inspired by other artist friends to give myself a Studio Night: one night a week that I would devote to creating new work. Last night was my first try at it. I worked for about four hours, with only a short break to eat and determine that Modern Family was a re-run. At 9:30, I made myself stop in mid-project, which was also a first. Most of the pieces I’ve done have been completed in one sitting, whether that sitting was thirty minutes or six hours, because I never really knew when I could get back to it. Promising myself that I will come back to it in a week makes it easier to leave things unfinished, and also gives me more time to visualize what I want the finished piece to be. There are a lot of designs I’ve put off doing because they were too time-consuming, but now I anticipate giving part of my weekly time over to making progress on those longer-term projects. Of course, I’ve got other plans made for next Wednesday night, and probably Thursday, and … okay, I haven’t quite worked this whole Studio Night thing out yet. But I am committed to the idea, and even if it’s not a set day and time, just knowing I have a space waiting for me makes it easier to wait until the opportunity arrives. ~ by admin on March 31, 2011.